Detroit Gospel.com had been anticipating our interview with Bajada Records recording artist Vanessa Williams during our weekly radio broadcast. But due to unforeseen circumstances, that opportunity was missed. However all things work together for the good, so the Detroit Gospel.com staff ended up interviewing Vanessa in downtown Detroit the day after her participation in the “One In Worship” conference which was hosted by Bishop Andrew Merritt and the Straight Gate International Church. As we enjoyed the view of the Detroit River and the shores of Canada, Vanessa began to open up to us about her career as a gospel recording artist, her life has a school teacher, her family, her passion for art, and working with gospel legend Richard Smallwood. I began the interview by asking Vanessa about how she started singing in her local church choir. Vanessa: When I was about 12 years old I was a member of Bethlehem Baptist Church in southeast Washington DC. My mom told me that I needed to do something in church. I tried ushering and the Jr. Missionaries, but it never went anywhere. Music and singing [were] always around our house so I gravitated toward the choir. It seemed the natural thing to do. DG.com (Carl B): So you were raised in the church? Vanessa: My grandfather was a pastor in Maringouin, Louisiana, and my father was the president of the National Baptist Deacons, and so church and church things have always been a part of my life. DG.com (Carl B): As you were growing up singing in the choir, at what age did singing become a serious ministry to you? Vanessa: I think at 12 you’re singing because mom tells you to, 13 because it’s fun, and 14 because you can. When I was 15 Tramaine Hawkins recorded “Goin’ Up Yonder”, that was my first solo. The minister of music wanted the choir to sing the song, so he did an “American Idol” thing and went through the whole choir to do the tag on the end that Tramaine did, and when he got to me I stood there and would not sing. He would not stop until I started singing. As I stood there I only thought that I wanted to sound like Tramaine. I believe that some songs you should not change – don’t mess with Stevie Wonder, Aretha Franklin, Richard Smallwood, or Tramaine. If you’re going to sing it, sing it word for word, line for line, so that’s why I wanted to sound like Tramaine. That was the first time I sang a solo in church, and even then it was the thing I liked to do. And when I listened to music I never listened to the lead singers, I would harmonize with the background singers. Somewhere in there I figured out I could hear. Singing in the choir was great; if all the altos didn’t show up I could switch parts. It was a lesson I didn’t know I was getting. DG.com (Carl B): You’re an overall creative person? Vanessa: Yes, I love art. I’ve been drawing since I was 4. I went to Howard University. I studied art, and my Bachelor’s degree is in Fine Art. Painting, drawing, and becoming an art teacher, I thought there was nothing better than that. With that I could encourage other kids. I do have a chip on my shoulder about schools that don’t have art and music programs. I don’t understand it. It’s an art thing that runs through me. DG.com (Carl B): Since you started singing at 15, have you done anything since that time to train yourself vocally, to improve upon your craft as a singer? Vanessa: (With laughter) No. I used to say that I never had any formal music training. But I sang 6 years with Yolanda Adams, I still sing with Richard Smallwood and Vision. Anytime you’ve spent any time singing with Richard Smallwood, you’ve been taught. I believe I’ve gotten a free education, not cheap, but a free musical education just because of the people who have sown into my life. Raymond Reeder who won a Grammy for Yolanda’s “Live The Experience”, the late Freddye Jackson, who co-wrote “Persuaded” with Richard, and Steve Lawrence from the Potter’s House. People like that who to me are just amazing musically. I know nothing except I can hear. People say Vanessa, come sing, and they teach me. And short of being in a classroom, just the people that I’ve had an opportunity to sit in a room with and they tell me to sing. These great talents tell me whether or not it’s right and how to sing more effectively. I couldn’t trade that for any time in a classroom. DG.com (Carl B): As you travel across the country how do you feel other cities compare to what goes on in DC? Vanessa: It’s the mission of a stranger; we tend to embrace them more, because of the novelty. It’s like when Jesus went home, Jesus was nothing but Mary’s little boy. At home sometimes it’s like “girl, I’m not going to pay to hear you sing, I can hear you sing at church”. You get that in jest, but sometimes people are really serious. I must say that I’ve been really received at home, even though I haven’t done that much at home since I’ve been recording. As far as Christian music in Washington, Richard is probably the best thing going. Not that there aren’t other very talented people in DC like Nolan Williams and Darrin Atwater. It’s a great place to be, it’s not a New York, or LA, but we’ve got the Kennedy Center, and the Lincoln Theatre. There are many places and things for singers. Detroit…which is one of the reasons I was so floored that Bishop Merritt was talking about this whole recording thing…I’m thinking, “Who, me? You live in Detroit!” I think people’s perception of Detroit is that if you take a microphone, go out on the street, stick it in somebody’s face, they can sing. DG.com (Carl B): Speaking of Bishop Merritt, how did you become connected with him to be a part of his label? Vanessa: Again, it goes back to Richard [Smallwood]. I came to Detroit with Richard to perform at Straight Gate. Steven Ford, who was the minister of music, invited Richard to sing at Straight Gate. I’ve heard Richard say there are not a lot of things he would do without Steven. Steven is such a great talent. When we came to Detroit, I thought we were going to a mall, when we turned on Grand River these flags were up on this huge building, and I thought – is this the church? That night during the concert Maurette Brown Clark and I sang “Angels,” and Bishop told me in 2001 he and Pastor Vicki were sitting there that night in 1997 and he said that he told her if we had a record company we would sign that girl. Steve called me again in 1998 to come sing at the church. I thought I was coming to sing at Sunday morning service. When Straight Gate sends the car to pick me up, I get in the car and there’s Bruce Parham. Upon arrival at the church I got to the music office and Steve tells me, “oh yeah I forgot to tell you this is a recording”. The result of that Sunday morning service was “Faith In The House”. That’s how I became associated with Bishop Merritt. DG.com (Carl B): You speak very highly of Richard Smallwood, how did you meet Richard? Vanessa: I was attending Rehoboth Baptist Church in DC, and I walked in the church with the late Freddye Jackson for a rehearsal, and I heard this music that sounded like Richard Smallwood. Sure enough it was Richard sitting at the piano with a baseball cap. Freddye asked me if I wanted to meet Richard, and I went, “you know Richard Smallwood?” So Freddye introduced me to Richard. As he sat there playing Richard shook my hand and then he said, “I hear you have a really nice voice”. You could have bought me for two cents. Freddye jumps in and says, “Vanessa sing something.” Richard started playing “I Love The Lord.” I’m thinking, ‘this is not happening to me,’ so I sang a little bit of it, and Richard told me I have a really nice voice. Several years later, when he started Vision, he asked me to join. DG.com (Carl B): Let’s talk about some of the songs you’ve recorded with Richard Smallwood. First, “Angels”, the duet with Maurette Brown Clark. When Richard started Vision, I remember walking into rehearsal and seeing Maurette, this little girl that I had seen in concert. As we were preparing for the “Adoration” recording, Richard taught the background parts to Vision and he said, “Van I want you to see what you can do with this first part,” and, “Maurette I want you to see what you can do with it.” I was so excited because I got what I had wanted. The night of the recording we didn’t want to sing on top of each other. So many times people laugh because they can’t tell who is singing what. She is such a generous singer. Vanessa: I didn’t want to sing that song. I didn’t think I was worthy to sing that song. When Richard taught the background parts, I thought Charisse Nelson McIntosh would sing it. When Richard said, “Van,” I had to ask God, “What is it that you want me to say?” Every rehearsal I was fishing, and then God told me, “If you want people to know about me, I’ve already given that in my word.” The night of the recording I had no idea of what I was going to say, my job was to fill in empty spaces and God gave me what I needed. DG.com (Carl B): How has the transition been from singing with Richard Smallwood to Vanessa Williams the solo artist? Vanessa: I don’t know if I’ve made it yet. Many people interview me and call me a former member of Richard Smallwood and Vision and I get an attitude. DG.com (Carl B): So you are still a part of Vision? Vanessa: Oh yes, Richard would have to either kick me out or disband Vision. I’ve heard it all, “You’re not a background singer any more,” but it’s nothing like the sound of your voice blending with other people’s. There has really been no transition. I only realize that I’ve been taught. For example when I went into the studio with Paul Allen, I had the lyric sheet, and Paul was surprised. But I’ve been taught that when you go into the studio be prepared because studio time is expensive. All of the sessions I’ve been in, it’s been like worship. We know what the vision is and the vision has been confirmed by Bishop Frank Reed, who prophesied that I [would] be a part of a new worship movement. DG.com (Carl B): You mentioned Paul Allen and PAJAM earlier, how did it feel to go from the softness of “ANGEL”, to the drive of “KEEP DOING”? Vanessa: They bring out the teenager in me. My niece Lauren, who is 11, said I sound like a young person. I envision PAJAM being two mad scientists in a palace somewhere creating all this music. I get their demo and I’m wondering what am I going to do with this. And what’s so great about PAJAM – they are not selfish with their gems. They took the time to listen to me, and say oh yeah Vanessa can do that. I can’t wait to hear J Moss’s project. DG.com (Carl B): One of your favorite artists is André Crouch. On this project you had a chance to work with one of André’s singers, Kristle Murden. What was that like? Vanessa: I was listening to one of the producers, Mano Hanes’ music and I’m going, ‘that’s Kristle Murden.’ And when I spoke to Mano he confirmed it was Kristle. I couldn’t believe it. Sometimes I can’t believe how God has blessed me. I’ve worked with some of the top producers. I didn’t want to be just another person putting out a solo project. For me to have done nothing but pack my bags, come to Detroit and sing. Steven Ford is one of the most in demand producers in gospel music. On my birthday in 2001, I’m sitting in the studio and I look through the glass and Fred Hammond is in the studio telling me what to do. Also I was told that Kevin couldn’t make it to Detroit, that I needed to go to Atlanta to work with Kevin Bond, the producer of Shirley Caesar and the minister of music for Bishop Eddie Long. Even Richard, took time from his studies to write a song for me. DG.com (Carl B): What are some of your favorite songs on the new project? Vanessa: “He’s Concerned About You” (I [hesitate] to call it a favorite). There are too many hurting people, and I’ve been hurt so I can smell it on other people. The song spoke to me, ‘what are you stressing out about now, all you need to do is call, he will hear your faintest cry.’ Kayla Parker wrote the song, and when I think about Kayla’s testimony, I can identify with it. DG.com (Carl B): Who is in your CD player right now? Vanessa: Lizz Wright, a preacher’s daughter from Atlanta. I heard her in concert in DC, and she sang a song that said “how can you lose your song when you’ve sung it for so long, how can you forget your dance when your dance is all you ever had…. one thing life cannot do, it can’t take the salt out of you.” Even though she’s a jazz singer there is something so soulful about what she does. I’m also listening to Karen Clark Sheard’s, “The Heaven’s Are Telling”. There is nobody like the Clark Sisters. I was a Clark Sisters fan. I have the albums. When listening to the Clark Sisters’ harmony, it is such an amazing thing. The parts are so complicated yet they sing it. DG.com (Carl B): What three gospel artists would you like to record with? Vanessa: Walter Hawkins, Walter Hawkins, and Walter Hawkins. He is on my wish list of people I would love to work with. DG.com (Carl B): What about Tramaine? Vanessa: I’ve had a chance to sing background with Tramaine. We went on tour with Richard and Tramaine so I had an opportunity to sing background. But to record with Tramaine, that would be great. I would also love for Donald Lawrence to produce me. Donald wrote a song on one of the GMWA albums, “A Song In The Midst Of The Storm.” I would love to record it and have Donald produce it. 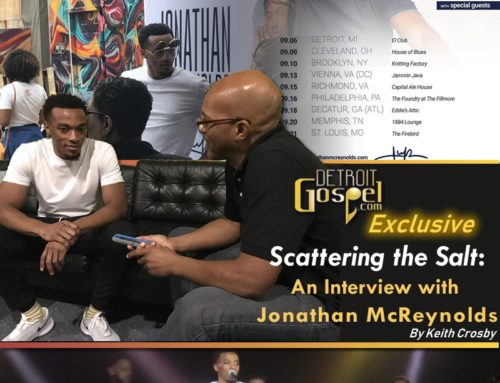 Vanessa wrapped up the interview reflecting on ministering through music during Straight Gates’ “One In Worship” held at Ford Field in Detroit. Audio clips from this portion of the interview will be added to the website soon. 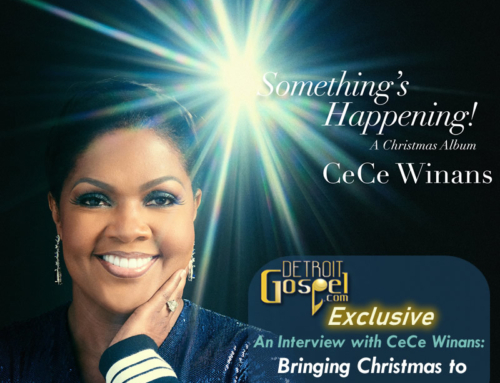 Editor’s note: I would like to thank Vanessa R. Williams for graciously inviting the staff of Detroit Gospel.com (Renee, Carl, and Keith) to spend several hours in fellowship with her. Her generous spirit was displayed even further when she allowed us to use one of her paintings as the cover image for a recent Detroit Gospel.com postcard. Thank you Vanessa for your warm and gracious spirit.